Aaron Hughes 6'0" x 19" x 2 5/8". Aaron wanted to free himself from the limitation of fins. This hand-shaped sled is all about hold and release. A super pinched step-rail provides the adequate hold when on-rail while a staged single concave provides the speed needed to enter controlled drifts, spins and hacks. Luke Coleman 6'6" x 21 " x 2 5/8". Luke asked for a classic 70's inspired single-fin to add to his quiver. This board featues a flat continuous rocker, wide point slightly forward and plenty of volume under the chest for paddling. The secret to a great single-fin is in the location and amount of spiral vee cut into the bottom of the board, a feature which keeps this board responsive for Luke in the wide range of conditions he surfs in. Ben Anderson 6'1 " x 18 1/2" x 2 1/8". Sustainability educator Ben Anderson came to us as one of the few surfboard companies pushing the sustainability agenda in surfing. We measured up a couple of his favourite shooters and designed this as a blend of both. 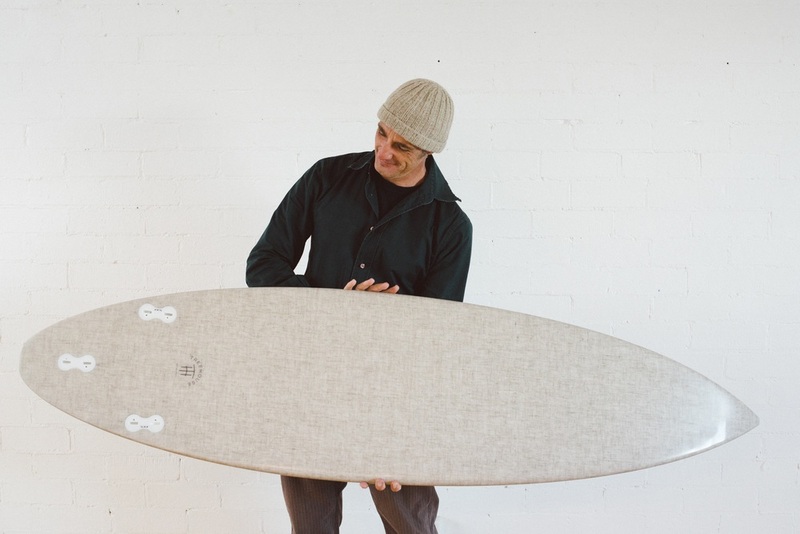 It features a recyclable EPS core, flax fibre bottom and plantation hoop pine deck. Glassed with Entropy bio-epoxy, this one will last for years to come. Erin Whitney 9'0 " x 21" x 2 1/2". This log for for Erin is traditional in shape but needed to be lighter to handle and a little narrower to remain responsive for a small, lightweight rider. It features a continuous rolled bottom, 50/50 rails and a little more lift in the nose than would be considered common to keep it fun and friendly for a progressing surfer. This board was constructed using an EPS core and has been glassed using pigmented 'S' cloth, flax fibre and Entropy bio-epoxy. It features a hand polished finish and screen printed mandala design. Matt Loft 4'5" x 21 " x 2 7/8". Matt wanted to trim the fat...remove any foam that wasn't essential. With clustered quads pulled to the rear of the corrugated tail this design has proved to be loose without being too skatey. Matt regularly reports the un-makable sections he's cleared with ease on this fast little ride. Madelaine Dickie 5'8" x 19 3/4 " x 2 1/4". The quad egg is a design we have been refining for years, a fast and smooth all-rounder in small to medium waves. This custom for Maddie is a little narrower and longer than our standard template to give her a little more responsiveness and paddle-ability. The quads are tight clustered allowing the two fins to work in unison. Adam Van Wijk 5'8"" x 19 " x 2 3/8". After having a try of an asymmetric prototype we had floating round the factory, Adam ordered one. A longer, straighter rail on the toe where more leverage is available and a shorter curvier rail on the heel allowing a looser pivot...an aknowledgement of body mechanics. This one is reported to have a nice glide down the line and a tight pivot off the heel.